I’ll be blunt. One day the church will realize that the developing mission field of online apologetics and discernment is a legitimate—and necessary—one. The reason you’ve seen the Lord raise up works like Apprising Ministries—helping to pioneer this field—is because of the indecision of many “names” within squishy evanjellyfish. You should know that I didn’t get where I was, for a season anyway, by being bashful. In that regard I’ll tell you why you don’t see more of those names speak out. Telling the truth comes with a heavy cost; right now AM has seen funding—and readership—drop sharply over the past week and a half, which may now head us toward some tough decisions. For those who have remained faithful in helping support this critical work in Christ, please know at this time I have no intention of backing off telling as it is or of shutting Apprising Ministries down. If I die, it’ll be with my boots on. Meanwhile, as this New Downgrade No-Controversy continues, leading spiritually comatose evangelical names are busy at yet another conference speaking to each other. By the way, when’s the last time you saw any of them holding their conferences in a small rural town somewhere; think there’s any pastors and Christians that need to be ministered to in settings like that? Now you know why God has been using the precious few works out there like this one. 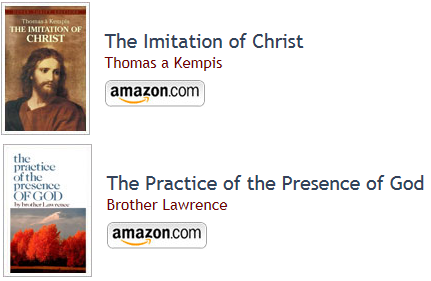 AM provides vital, and often as it happens, information for dear saints in those areas right on their computer screen. I’ve been blessed to have had the undeserved privilege of serving many, many pastors—as well as sheep without shepherds—this past 6 years. Now, with this important background we come to the main topic of this piece. Recently in Steven Furtick And James MacDonald I informed you of an upcoming conference to be put on by rising Seeker Driven prophet -pastor Steven Furtick, who gives reasons for concern, e.g. Steven Furtick And “Prophet” Brian Carn. Let me make sure you understand here that 1) I’m writing in a tone we’d use discussing this over coffee, and 2) in no way, shape, or form, do I consider Matt Chandler anything like someone such as the apostate Rob Bell of the Emerging Church. Chandler is not a SD/PD quasi-prosperity preacher like Steven Furtick; rather, he is clearly of the charismatic Acts 29/Young, Restless and Reformed camp. As such, people have been writing me asking why Matt Chandler’s made this curious decision. It serves to bring to mind when I listened a few days ago to Todd Friel’s excellent two hour long discussion with Phil Johnson of Grace to You and Pyromaniacs on his Wretched Radio program. I’ll tell you it’s well worth your time to get hold of that podcast. Friel and Johnson took the time to discuss a number of topics, one of which was the YRR movement. Like any movement, the YRR has some growing pains and is still finding direction. 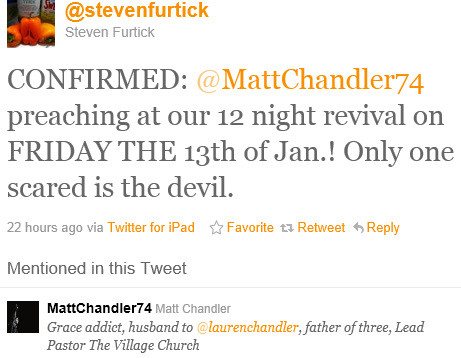 Unfortunately, it looks to me as if Steven Furtick has set his sights upon a section of it. I don’t know what Chandler is thinking in regard to Furtick, but I have a theory that charismatic practice and Contemplative Spirituality/Mysticism ala Living Spiritual Teacher and Quaker mystic Richard Foster‘s a really bad mix, and may be a factor concerning some YRR drift. Resisting the urge to wrestle with the serpent, let me just say I think we’d agree that this wasn’t exactly a flattering portrayal of so-called “Old” Calvinism by Mark Driscoll. 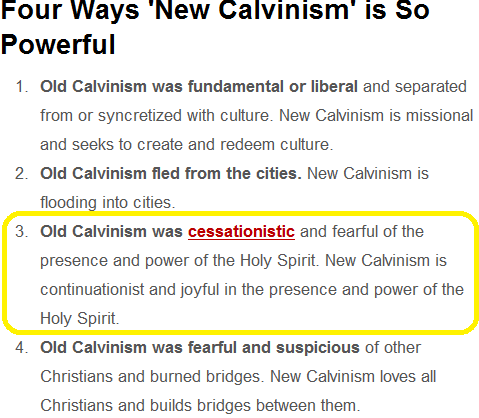 As I read it, I would say one of his points is that this “New Calvinism” is superior to the old. We can argue that another time; I’m just saying that’s not an issue with me. As one who’s been in the ministry fields of non-Christian cults, apologetics, and Comparative Religion for 24 years, my concern is it seems as if some in the YRR are developing a postmodern form of Calvinism. This would actually be an oxymoron; holding of some form of Reformation theology and marrying it to Counter-Reformation spirituality. I think this is why we now see some well known in YRR circles are mixing in with the Seeker Driven—quasi-Word Faith—prophet-pastor Steven Furtick. 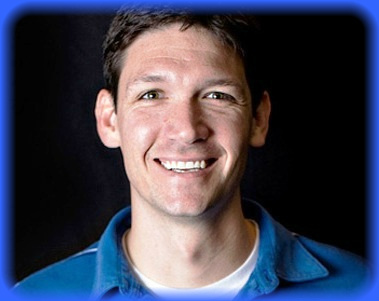 In closing this, for now, let me show you what I think are some curious decisions specifically touching upon Matt Chandler. Lord willing, as you’ll see in coming days, this also applies to others in the Acts 29 and broaderYRR camps as well. Let’s go right now to the website of The Village Church. 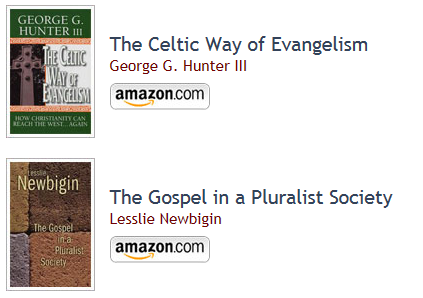 The highly ecumenical Leslie Newbigin helped spawn A Generous Orthodoxy by Living Spiritual Teacher and EC guru Brian McLaren, one of the unholy Emergent Church trinity of apostates along with heretical quasi-universalist pastor Doug Pagitt and his equally heretical “theologian in residence” Dr. Tony Jones. Celtic spirituality was at the corrupt heart of the recent Emergent Church apostasia-palooza they called The Wild Goose Festival, which certainly should be more cause for concern. 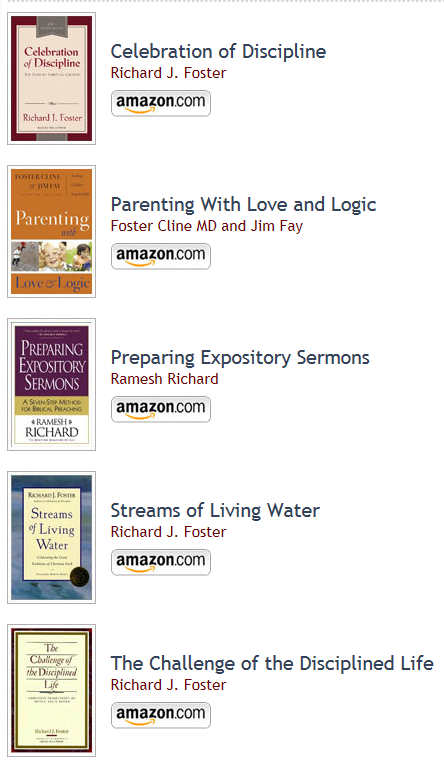 As a pastor-teacher myself, there’s no way I would recommend the books discussed above who are under my care. So, concerning what I see as rather curious decisions, here I’m simply going to ask, why? Back to note 1 — See Gary Gilley Reviews Richard Foster “Celebration Of Discipline” and Richard Foster: The Bible A Reliable Guide Despite Inconsistencies. Back to note 2 — See Philip Yancey And A Non-Stance On Homosexuality and Affirming Christian Network, Philip Yancey, And Gay Christian Network.